Blend the fruit first using half of the liquid. Once combined, add the greens and the rest of the liquid. Blend until the consistency is smooth. *Remember, there are no rules or limits to your creativity. If you don't like kale, just stick with the spinach. 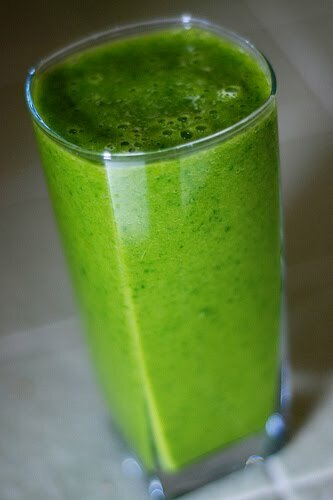 If you want your smoothie thicker use less liquid. If your cutting calories use water instead of juice...the options are endless! Try your personal favorite green vegetable and let me know how it turns out. Keep in mind that different vegetables take on different flavors and levels of bitterness and vitamins. Enjoy for breakfast or as a healthy snack in the middle of your day! Let's complete the series, with step 3 of the challenge. Executing this move will strengthen your back, glutes, hamstrings, lats, shoulders and core. Remember to take your time as you do this and push yourself to try it with your heavier set of weights (5- 8 lbs). This exercise is a great fat burner because you are using a lot of muscles at once to achieve a movement. Because we aren't using very heavy weights here for all of the muscles involved, we can afford to push the amount of reps we do so that we can feel the total body effects. Start with you knees slightly bent. Fold over at your hips while letting the weights drop towards the floor. Maintain your posture and keep your back flat. The triceps (on the back upper part of the arm) or lack thereof are responsible for that extra giggle every time you wave goodbye. The three muscles that combine to form the tricep are responsible for 60% of your arm muscle make up. It is not the source of annoyance for everyone though, it can serve its' purpose of assisting with any pushing motion that we do. Increasing the strength in our triceps helps to improve the overall strength in our arms and helps the arm to show as toned. Whether it be Michelle Obama or Jessica Biel arms that we want, one should know that the only way to get strength and toning is to isolate and work the muscle. Start with these tricep extensions and feel the burn! Feet are parallel, knees are bent, and your body is between a 45 and 90 degree angle to the floor. Pull elbows up towards the ceiling and extend arms straight back. Halibut is a lean, meaty, flaky white fish that has its own natural sweetness. I personally think it needs quite a bit of flavor injection, but it being such a substantial piece of fish makes for good, hearty eating. FYI- Every food has a season and the prime season for the best Halibut is during the summer and fall months unless frozen (which is available all year round). Hailbut is full of protein, Vitamins B6, 12, and 3. It contains a lot of minerals and of course our favorite: Omega-3 Fatty Acids (which helps keep a healthy, well functioning heart). Make sure you are familiar with a local store that sells fresh seafood (Whole Foods can work too). Get to know one of the people who work there so you can build up your relationship and they can honestly let you know what is "really good" and priced well. Fresh Halibut will be glistening white, without any signs of spots or discoloration. Make sure it does not smell FISHY, it should smell like seawater, not an off-putting fish smell. Refrigerate it immediately. After unwrapping the fish, rinse it under cold water and pat it dry with a paper towel before seasoning. Combine ingredients for the marinade. Set aside about 1/4 cup of marinade to baste the fish as it is grilling. Place your marinating fish into a Ziplock bag and into the fridge for 1 hour. 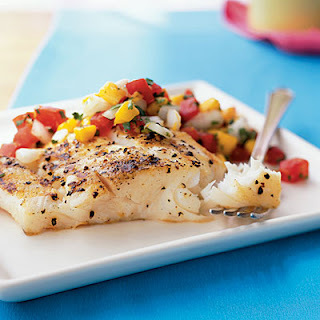 While fish is marinating combine Fruit Salsa ingredients and allow the flavors to blend while waiting. Get your grill prepped for the fish by spraying a nonstick coating on the pan. Remove Halibut from the marinade and place onto the medium high heat. This should take about 5 min. on each side. You'll know its ready when the fish is easily flaked apart with a fork and it will be tender. Serve while hot and top with your fruit salsa. Enjoy this hearty healthy meal! It is so important to start using weights if you don't already. They won't bulk you up ladies, but it will help ensure that your bones remain as strong as possible to carry you into the many years to come. I know all too well that showing up to the gym and avoiding the "weights" area saves a lot of anxiety. I work with so many women who are afraid of the men on the weight lifting floor, but after I guide them through the area and show them that machines and weights are there for them as well, the "DO NOT ENTER" zone is much more inviting. Just try it one day. Walk through those doors, head straight to the weight lifting area... and get going. Get your 3-15 pound weights and set up your own area. No one will look at you strangely (I promise). Just zone out from your surroundings and tune into the task at hand: losing weight, toning your body, and strengthening your body from the bones out. We have a different hormonal make up than men, which makes it almost impossible to build bulky muscles like guys do. Lifting lighter weights and doing a substantial amount of reps with proper stretching afterwards will build your muscular endurance and give you long lean muscles like a dancer. Try some of these moves the next time you go to the gym, park, or beach. Have fun feeling the burn and knowing that adding weights to your workout will add years to your life. Stand with feet in a parallel position, knees slightly bent, and belly button pulled into your spine. As you bend your knees deeper feel as if you were sitting in an imaginary chair and bring the weight closer to your chest into a bicep curl. It's been proven that lifting weights regularly will decrease body fat, reduce blood pressure, improve your athletic abilities, reduce the risk of heart disease and diabetes as well as reduce injuries, back pain & arthritis. Join me at the gym, I'll be in the weight lifting section.